When walking around London's Covent Garden, we saw a bunch of girls with delicious looking frozen yogurts in their hands. Intrigued, we followed the froyo trail that led us to Snog (love the name). It's similar to other froyo shops that have been popping around everywhere, except that it's on crack. As soon as you walk in, you are greeted with bright colours everywhere. From the neon pink sign, to the animal wall art, to my favourite, the iridescent rainbow coloured lights on the ceiling, the entire vibe is just so fun and cheeky. 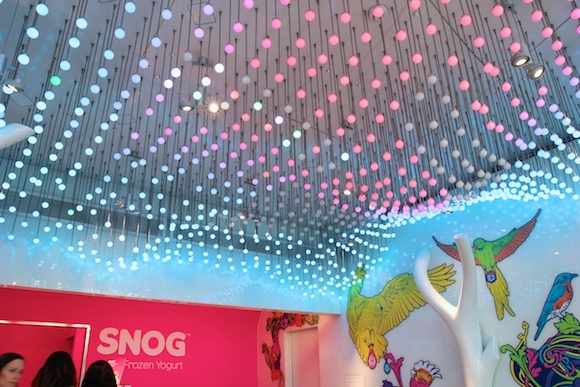 Snog is pure frozen yogurt that’s not only super delish but super healthy (made from non-fat organic yogurt and organic skimmed milk, and sweetened with agave nectar). 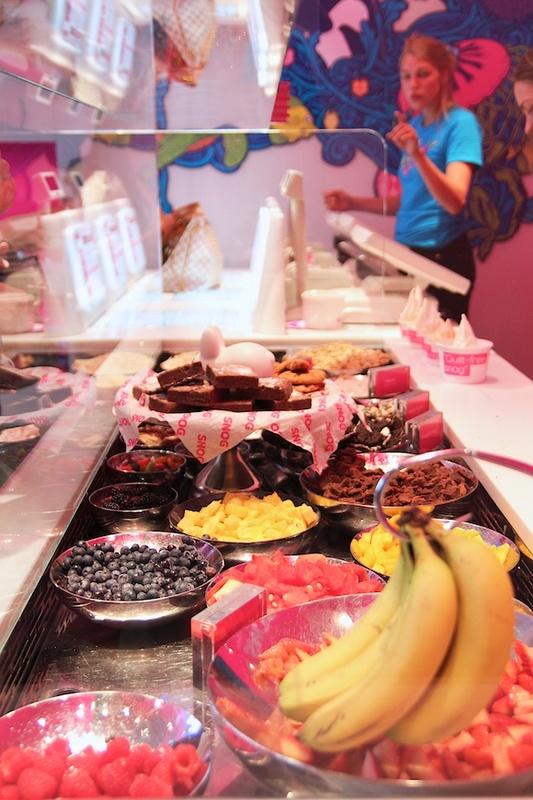 A counter filled with yummy toppings such as chocolate, candy, nuts and fresh fruit are on display. And with various yogurt flavours like green tea, strawberry, natural, and chocolate, the combination of snogs are endless. We ended up getting passion fruit with mangoes on top. The yogurt was lovely: smooth, sweet and very flavourful. It was the perfect treat on a hot summer day. 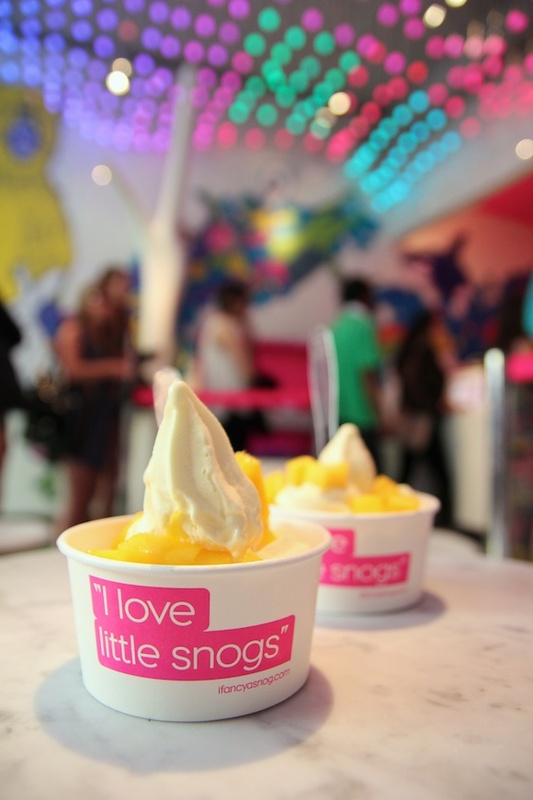 I love a good snog. 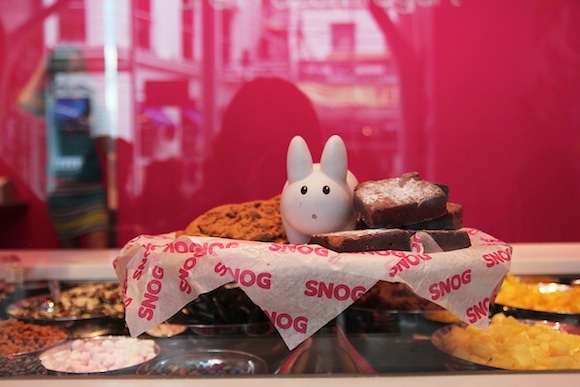 Really great pictures of Snog!